i -have- been knitting, i swear i have. here's pix to prove it! here's a shot of maya's hat so far. this is to match maya's mittens. i'm planning for this to be one of those long stocking caps, the kind that are kinda shaped like a cone. i will put a nice floofy pompom on the end of it. 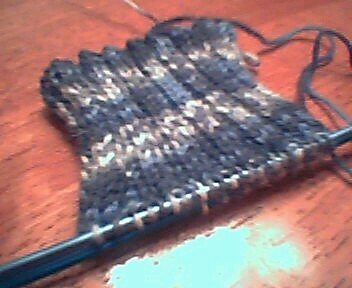 check out the progress i'm making on my sox! this is my first time using real, pure-dee sock yarn. i'm using regia ringel. it's self-patterning, which i think is very neat. too bad i didn't think up the idea of self-patterning sock yarn. 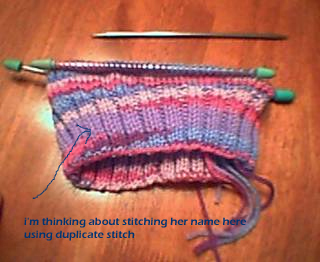 i'd be a millionairess ;-) anyhoo, i'm using this online class to make these sox. so far so good! can't wait to wear 'em! My name is Natalie and I wanted to invite you to visit my new forum called NatSkins. There you can find Blogger skins or Blogger scripts that you may find useful. It's still new, but it would be awesome if you would like to contribute anything you may know about blogger. We're always looking for new members. You can also show your blogger off to others.